Banding or Strapping Machines is a tried and tested, popular type of packaging machine that is available in semi-automatic and fully automatic forms. A Strapping machine is used in industry to tightly apply a length of plastic strapping around a pack to provide containment , strength and security. The banding machine applies an adjustable level of tension when applying the banding around a product to secure it during transit. 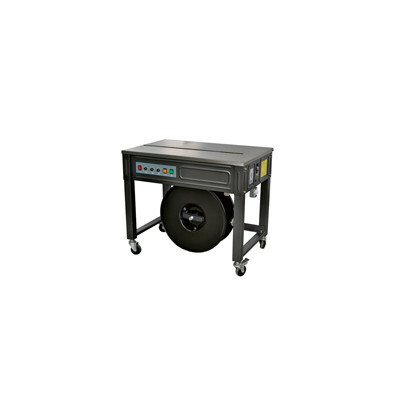 A strapping machine may also be referred to as a banding machine both terms are regularly used to describe the same piece of machinery. One of the main differences between strapping machines is the operatinal functions ,they are availabel as a manual, semi-automatic which is a standalone machine for low to medium volumes, or fully automatic which is for medium to high applications. A non-operator fully automatic machine is the quickest. We have a banding machine available for any packaging application. The benefits to having a strapping machine are numerous and include having the facility to fasten and secure boxes, secure and restrain top lids and closures, provide multipack containment .Also the straps can also be used as a handling aid or even reduce transportation costs by strapping units together. Aesthetically, strapping is better than packaging tape, giving a neat and tidy appearance. It offers improved strength and support for the safe transit of product To use a semi-automatic banding machine the operator places the pack on the top of the strapping machine. The operator takes a strapping over the parcel and inserts it into the strapping guide, at which point the machine pulls the strapping material until it contacts the product, it then heat seals the strap and cuts it,the strapping machinewill then automatically dispense a length of strapping ready for the next parcel. The total strapping time, is around three seconds. An automatic banding machineworks by the same principals except it allows for hands-free operation to strap parcels or products. The parcel is placed in the middle of the strapping arch built on top of the machine. Operation of the strappingmachineis by foot-pedal, two push buttons, a microswitch or a magic eye and the strapping cycle is instantaneous. The banding machine the operation in around 1.5 seconds.